The weather this afternoon here in Forest Hills has been just spectacular for approaching the middle of November and this weekend is looking like more of the same, with sunny skies and temps in the 60’s. Today’s beautiful weather offered up a great opportunity to capture some exceedingly pleasant photos of our neighborhood as the sun set on another work week. 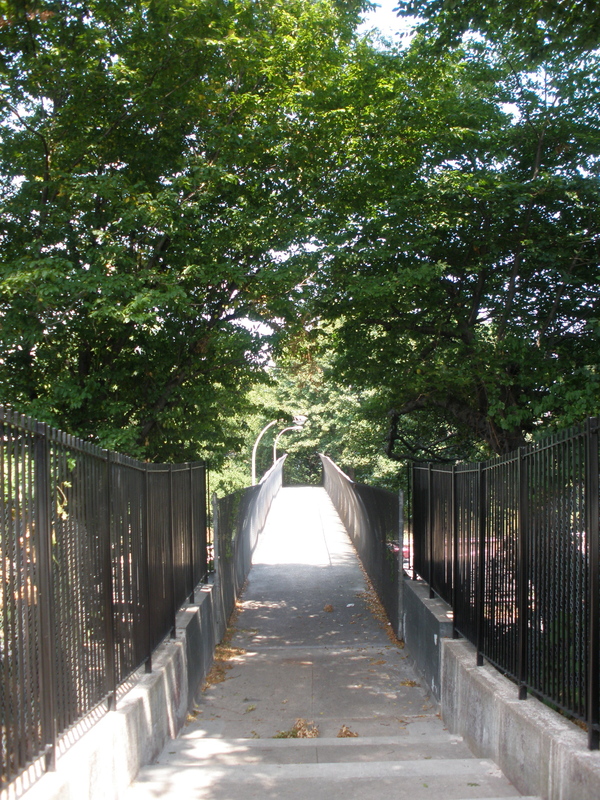 As mentioned in a previous post, work is progressing on the pedestrian bridge that will allow you to walk from Forest Hills, over the Grand Central Parkway, to Willow Lake, a wildlife preserve that is is in the process of being restored at Flushing Meadows Corona Park. It looks like they are doing a very nice job of restoring this walkway. The NYC Parks Dept has approved the project to spruce up the triangle sitting park at 67th Av and Queens Blvd. It will take place on Saturday, August 14th from 9:00- 11:00. It’s a small project, nevertheless, our efforts will go a long way in bringing attention to the “park’s” inferior condition. I need about 10 volunteers to help clean, paint, plant, and prune. I know it’s the middle of summer, but you would be giving up just 1 or 2 hours of your time and making a big difference in our community. Tools, gloves, and equipment will be provided. Breakfast is on the house. Book raffle will be held. If you need transportation to the site, let me know. Free breakfast and raffle for a little sweat equity. Hey, how simple and worthwhile does a community project get?! I hope to meet some of you out there on the 14th. 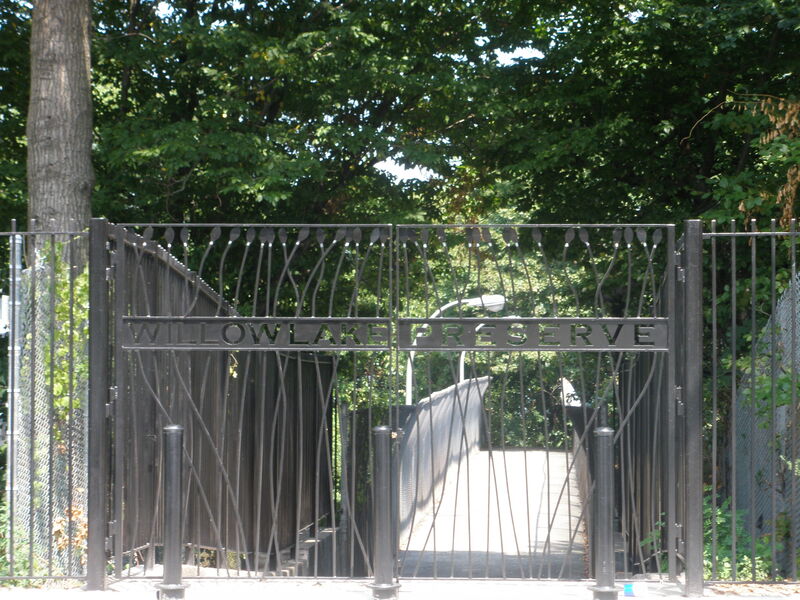 And here is more information from the NYC Parks Department on its plans for the area’s restoration. This will be a terrific thing for Forest Hills when completed. Imagine taking a short walk to a lake and nature trail. I will check it out when I have some time and post some photos of the restoration. If you have any more information about it, please post below. Thanks. 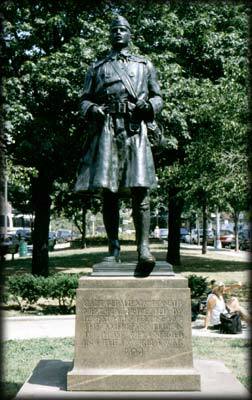 The statue of Captain Gerald MacDonald (1882-1929), a World War I soldier and former resident of Forest Hills, in MacDonald Park. Feedback on the neglectful condition of MacDonald Park has already been forwarded to Parks and Recreation and our local elected officials. The recently renovated park, costing some $800K, still leaves much to be desired. It’s an embarrassment to Forest Hills, what with The Gardens located just 5 blocks away. Another potential volunteer project that came to mind is a spruce-up of the small sitting park on the triangle at Queens Blvd and 67th Av. All bollards and benches need painting and the 2 long-standing barren tree pits need trees or at least some kind of landscaping for the elderly to enjoy. Simple, yet effective. Permission from NYC to carry out this project to be requested. This community project would only take about 2 hours to complete. Anyone interested? Any ideas to improve our neighborhood’s look and feel? Drastic city budget cuts have prompted many community groups city-wide to step in and assist in tiding over basic quality of life shortfalls.